The classic Polish dish of tender pasta-like pockets filled with potatoes and cheddar cheese or a farmers cheese. Peel the potatoes and cut into large chunks. Place in a pot of cold water, and bring to a boil. Boil until the potatoes are fork tender. Drain the water off, return the potatoes to the post, and add the cheese, salt and pepper. Cover the pot for a few minutes to allow the cheese to melt. Using a potato mashed and spatula, mash and stir the potatoes to incorporate the cheese. It's fine if there are still a few lumps. Place potato mixture in the refrigerator until cooled completely, and ready to use. Combine the flour and salt in a large bowl, and make a well in the middle. Place the eggs and sour cream into the well. Using your fingers, gradually work the flour into the eggs and sour cream until you have a crumbly mixture. Slowly work in the water. You will think you haven't added enough, but as you work the dough, it wil come together. So it is better to add the water very lowly, then wet your fingers to work in more water as you knead, as necessary. Once the dough comes together, knead it until is is fairly smooth and elastic. Form dough into a ball, and let rest for about 10 minutes (I've let it rest up to 30 minutes, but I was not happy with the results the one time I tried to make the dough the night before). Roll the dough on a floured surface, using about a quarter of the ball at a time, VERY thin - as thin as you feel comfortable working with. I like to use my KitchenAid pasta roller, starting at a setting of 1, work my way to a setting of 4. This is probably less than 1/8" thick. Place the rolled dough on a floured surface, and cut circles about 3-3 1/2 in. in diameter. Place about 1 T of the desired filling offset from the middle of the circle, fold the circle over, and press the edges together with a fork to seal completely. Bring a shallow pan of water to a gentle simmer (do not boil). Add pierogies and simmer for about 15 minutes. Do not overcrowd your pan. Stir gently to keep them from sticking to the bottom and to each other. They will be floating when they are done. Remove from the simmering water, and place in a baking pan or on a sheet pan sprayed with cooking spray, and top with some small bits of butter to keep them from sticking. Continue until you have cooked all of the pierogies. 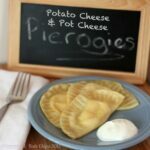 We like to serve pierogies with sour cream. If you are not going to serve the pierogies within a day or two, they freeze well after boiling. Just thaw and cook as desired.